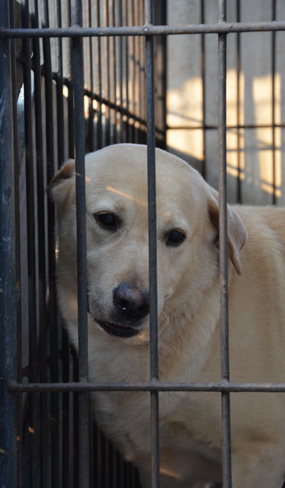 Upon arrival at a dog farm located in the suburb of Diangbei, I observed caged dogs. However the animals here were apparently not to be sold for their flesh, but for pets. I could not see anything that could possibly provide the animals with any comfort. There were a couple of larger and smaller dogs within tiny cages. One of these animals looked quite old. Many of the dogs were German Shepherds. The dogs were barking alot when I stood near to the cages.